If you are looking for an apartment where design is paramount, quality is essential, community is encouraged, and the service is extraordinary …. you’ve found your new home! The Franz is a new urban 58 unit apartment building located in West Downtown. 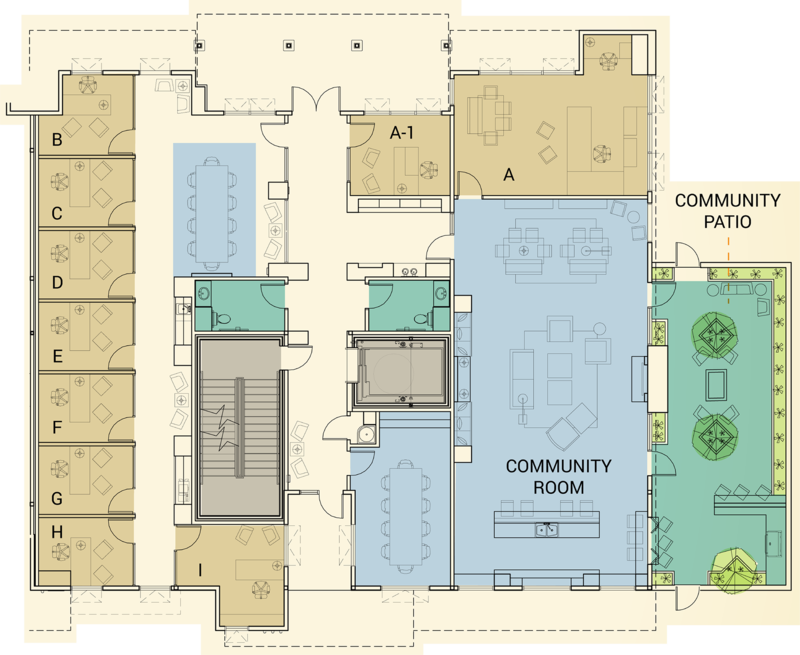 This building was designed specifically to create community with an amazing lounge with a fireplace, comfortable sitting areas, shared kitchen island, work spaces and a dedicated conference room. Residents can enjoy the private east facing courtyard and grilling area as well as a small gym, dog walk area, a serenity roof top deck and additional storage. The Franz is located at Country Club Plaza in West Downtown where some of the city’s best restaurants are steps away from your front door. Amore Neapolitan Pizzeria and Vino, Boxing Bear Brewing, The Modern General and The Feel Good are all located at the Country Club Plaza. Walk or bike to numerous outdoor trails, downtown events, nightlife, restaurants, growers markets, and more. Hover to view closer detail, click to view enlarged individual floor plans. Hover to view closer detail, click to view enlarged individual floorplans. Hover to view closer detail. Why should I choose the Franz to be my new home? If you are looking for an apartment where design is paramount, quality is essential, community is encouraged, and the service is extraordinary …. you’ve found your new home! The Franz is a unique apartment community that is managed onsite by Heather Gallegos, Director of Operations and Jay Rembe, the property owner. This management style provides for more personal interaction with tenants and creates an apartment community that feels like a neighborhood. Our community lounge will be a wonderful place for tenants to meet their neighbors while relaxing fireside, grilling on the patio or watching the big game. “The Franz” is named in tribute to Franz Huning, a German emigrant that made his way to New Mexico working as a cowboy along the Santa Fe Trail. He settled in Albuquerque in 1852 where he became a mercantile owner, flour mill operator, railroad colonist, hotelier, land speculator, publisher, farmer, civic leader and entrepreneur. Franz Huning is one of the city’s most influential developers and played a significant role in developing our neighborhood in West Downtown. The Franz is located at Country Club Plaza in West Downtown where some of the city’s best restaurants are steps away from your front door. Amore Neapolitan Pizzeria and Vino, Boxing Bear Brewing, The Modern General and The Feel Good are all located at the Country Club Plaza. Other amazing West Downtown restaurants include Duran’s Central Pharmacy, Remedy Coffee, Garcia’s Kitchen, Vinaigrette, Café Laurel, Cheese and Coffee, Seared and many more! We currently have a walking score of 88! The Franz is located adjacent to one of the oldest neighborhoods in Albuquerque with a handful of pocket parks and a beautiful area to stroll on a Sunday morning. The Bosque Trail, Albuquerque’s walking, running, biking path is less than 1 mile away. The Bosque is one of our city’s treasures where urban life connects with nature trails, the Rio Grande River and one of the largest cottonwood tree forests in the world. Free parking is available on the north side of the building (based on availability) and there is paid parking for secured and gated parking on the south side of the building. Don’t worry, if you don’t have a car, the Franz is between two Albuquerque Bus Rapid Transit locations. Or feel free to use one of the PACE bikes located on site. We have a total of 26 cameras strategically placed throughout Country Club Plaza. Every tenant has access to an App that displays all cameras to allow tenants to check on their cars at any time of day. We love having furry friends at our properties! We require a $250 non-refundable pet deposit and $50 pet rent per pet per month. Because we have so many dogs on site, we do not allow aggressive dogs. We also have a pet walk area to the south of the Franz and pet stations throughout the property to make ensure that everyone picks up after their pets. When you’re hanging out in the lounge, grilling a burger on the patio or working out in the gym, you can connect to our free high speed WiFi brought to you by Centurylink fiber lines. Is the Franz a smoke free community? When can I tour The Franz? The Franz is scheduled to be complete during the month of May 2019. As the project is under construction, tours will need to be scheduled with Heather Gallegos, the Director of Operations for Rembe Urban Design + Development. She can be reached at 505.243.0188 or by email at admin@rembedesign.com. Please contact Heather if you would like to be placed on the waiting list. Well, to start, they are smart and modern. Common features include smart locks, large windows, stainless steel appliances, polished concrete in the community and co-working spaces, wood vinyl throughout the units except for bathrooms which have porcelain tile, and closets with Rubber Maid closet systems. Check out our pictures for the Country Club Lofts to get a better idea of the aesthetic we are delivering. The Franz offers a variety of floor plans, including co-working space and professional suites, studios, 1 bedroom and live/work units. There are no 2 bedroom units in this project. We know everyone has different ideas about space and price, so we wanted to cover every base. How much are rents at the Franz? Each home at the Franz has been carefully value-priced according to its unique characteristics such as unit size, location in the building and unique special features. Prices range from $905 to $1,400 plus utilities. Be sure to visit our “Availability” page where you can filter your search based on rent, size, etc. You can also contact our leasing team at 505.243.0188 or email at and we will be happy to share the current rent for any specific unit you are interested in. 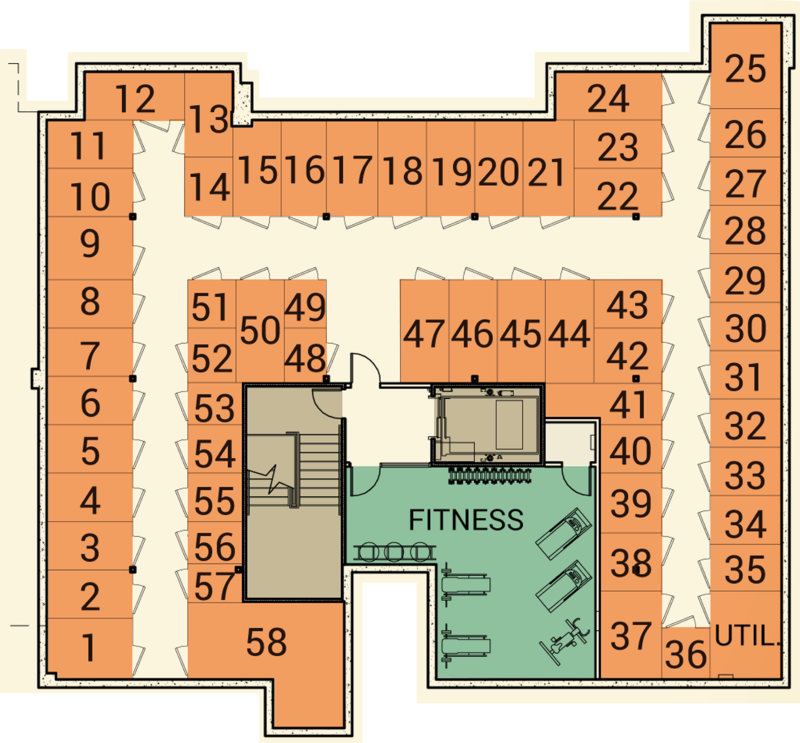 What amenities are at the Franz? This is the fun part. There is an amazing community lounge with a fireplace, comfortable sitting areas, shared kitchen island, working spaces, a dedicated conference room with video conferencing equipment and an indoor/outdoor counter opening to the private courtyard. The private east facing courtyard will be beautifully landscaped with a grilling area and community table to encourage and promote community events. There is also a fitness center, dog walk area, a serenity roof top deck and ample storage for both residential and commercial tenants. Tenants will put the PNM electric bill in their name and pay it directly plus a monthly $30 water, sewer, refuse and recycling fee per tenant. The building is wired for both Comcast and Centurylink so it is up to you what internet and cable service you want. We will also have fiber optic lines available through Centurylink. How do you promote community at the Franz?